All entities (Categories, Departments, Distributors, and Manufacturers) share the same attributes. Those attributes are broken up into 8 tabs, which are explained below. Name The entity's name. This is visible to all customers. Published This option determines whether or not the entity will appear in the menus/sitemap on your store's front end. Show in Product Browser This determines whether or not the entity will appear in the mini-browser on pack product pages. Parent From this drop down menu you can make this entity a sub-entity of another entity, or assign it to be a parent-level entity. Display Format XML Package This dropdown allows you to select the XML Package used to display this entity on the front end. The list displays all entity. ***.xml.config packages present in the XmlPackages folder. Quantity Discount Table If any quantity discount tables have been created, you can assign one to this entity here. This discount will apply to all products in this entity or any sub-entities of it. Page Size If the entity contains products or sub-entities, this value determines how many of them to show per page. Column Width If the entity contains products or sub-entities, this value determines how many columns to use to display them. Order Products by Looks This field is not currently used "out of the box". Note: Manufacturers and Distributors have additional fields on this tab, for address and contact information. All but the email address field are optional. Image Filename Override In this field, you can specify a filename (with extension) to use for this entity's images, instead of the entityID.jpg format that the software will generally use. If this field is populated, the other fields on this tab will be greyed-out so that images cannot be uploaded through this page. Images will have to be properly named and manually FTP'd to the site. Icon This field allows you to browse to and upload an icon-sized image. Medium This field allows you to browse to and upload a medium-sized image. Large This field allows you to browse to and upload a large-sized image. Note: See here for information on configuring the software's image resize tools. Information entered on the Summary tab is not actually displayed anywhere on the front end. This can be used for internal notes, special instructions, etc. 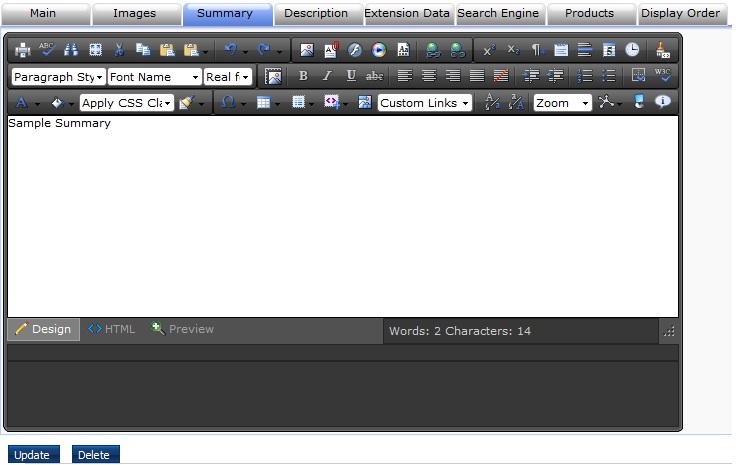 This tab uses the Telerik RAD editor, and can accept HTML code. To insert HTML, click the “<>” button at the bottom of the editor. The Description tab is where general entity information is entered. All of this information will be displayed to customers at the top of entity pages. This tab uses the Telerik RAD editor, and can accept HTML code. To insert HTML, click the “<>” button at the bottom of the editor. Information entered on the Extension Data tab is not actually displayed anywhere on the front end. This can be used for internal notes, special instructions, etc. The fields on the Search Engine tab are used to generate the “meta” information for your entity pages. This information is part of what most search engines use to index your site's pages, so you should take the time to put good information here. Note: The “No Script” field is not used. This tab allows site admins to make bulk changes to products within this entity. Products for **** Clicking this link will take you to Product Manager, displaying the product list for this entity. Display Order Clicking this link will take you to page where the display order for products within this entity can be manually set. By default, products display alphabetically. Inventory Clicking this link will take you to page where the inventory levels for all products within this entity can be adjusted on one page. SE Fields Clicking this link will take you to page where the Search Engine fields (which generate meta tags) for all products within this entity can be set on one page. Prices Clicking this link will take you to page where the prices for all products within this entity can be adjusted on one page. Download Files Clicking this link will take you to page where the download files for all digital products within this entity can be specified on one page. On this tab, site admins can set the display order of sub-entities (if any). Just enter the desired order and click "Update Order". If all fields are left on the default (1), sub-entities will be organized alphabetically.